The Dooly Bearer Corps at Talana numbered 199 men- with the exception of 14 members from the Ahedabad District who managed to escape to Pietermaritzburg with some of the wounded, virtually the entire Corps was later interned at Ladysmith. 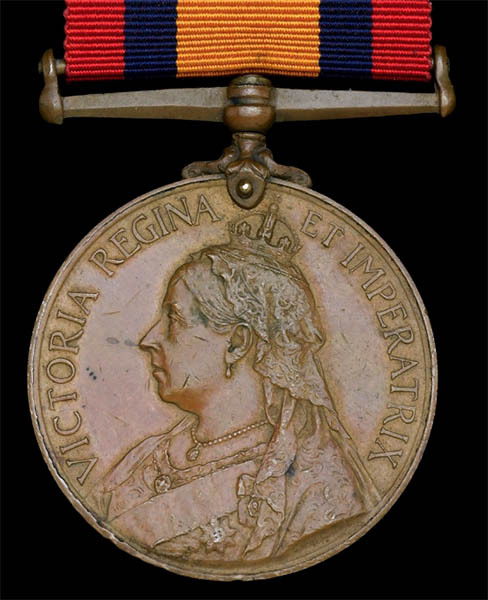 Sold with copied medal roll extract, which shows ‘entitlement’ to the clasps, Belfast, Orange Free Stare, Talana, Defence of Ladysmith, and Laing’s Nek’, with the later annotation ‘no clasps to be issued for these followers’. 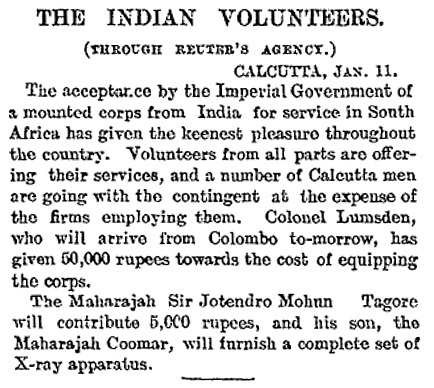 I was browsing The Times from 12 January 1900 and came across this small piece about the donation of a x-ray equipment by the Maharajar Coomar. An unusual but I am sure very welcome gift.